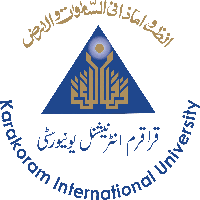 Admission Form/Prospectus is available in Student Affairs Office Karakoram International University Gilgit and Degree College Chilass on working days (Monday to Friday between 8.00 am to 4.00 pm) on payment of Rs. 1000/- through bank draft/ challan in the name of Treasurer KIU Gilgit-Baltistan. Admission Form/ prospectus can be downloaded from the KIU website (kiu.edu.pk). Candidates applying against the RESERVED seats must provide the relevant certificate(s) i.e. Sports Person from District Sports Board, Special Person from Medical Board and for Armed Forces apply through Welfare & Rehabilitation Directorate, GHQ, Rawalpindi. Incomplete and late received forms will not be entertained. The Candidates will be responsible to keep track record of the KIU website for the date of interview for different programs applied for. No separate call letters will be issued.